"In a world like this one, it’s difficult to devote oneself to art body and soul. To get published, to get exhibited, to get produced often requires ten or twenty years of patient, intense labor. I spent half my life at it! And how do you survive during all that time? Beg? Live off other people until you’re successful? What a dog’s life! I know something about that! You’re always recognized too late. And today, it’s no longer enough to have talent, originality, to write a good or beautiful book. One must be inspired! Not only touch the public but create one’s own public. Otherwise, you’re headed straight for suicide." 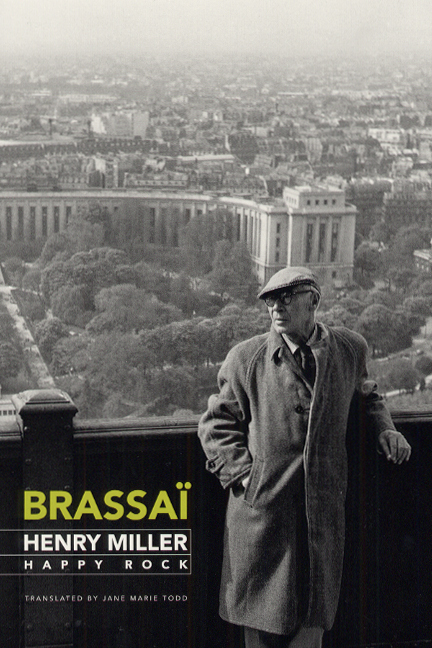 That’s Henry Miller’s advice for young aspiring artists, as remembered by his very good friend Brassaï in this lively book. One of two that Brassaï wrote about the man who called himself a "happy rock," this volume covers their lives and friendship from the 1950s to 1973. Over the course of a number of warm, intimate conversations, Brassaï and Miller revisit their careers; discuss art, literature, Paris, Greece, Japan, World War II, and more; and consider the lives and works of many others in their circle, including Lawrence Durrell, Henri Matisse, Salvador Dalí, Georges Simenon, André Malraux, Hans Reichel, Paul Klee, and Amedeo Modigliani. Throughout Miller’s zest for life shines through, as do his love of art and his passionate intensity for just about everything he does, from discussing a movie or play he’d just seen to reminiscing about a decades-long love. Brassaï’s Henry Miller, Happy Rock presents a vivid portrait of two close friends who thoroughly enjoy each other’s company—and just happen to be world—famous artists too.